Since this is my first blog I figure I may as well start off the way I start each new photography class that I teach. In an effort to get my students to change their photographic perspective I have them pretend to be cats. Cats see the world from a different perspective than us humans. They hardly ever see things from five feet above the ground like we do. Cats get low and crawl under things. Cats climb up on fences and cars. They climb trees and perch on fence posts. I call this first assignment of the course Cat’s Eye View. My current group of students were particularly successful with this assignment. Not only did they come back with some very interesting images, but two kittens actually followed them back to class at the end of the period! Ansel Adams apparently said that “A good photograph is knowing where to stand.” I realize that it is pretty nervy of me to challenge the venerable Mr. Adams in my very first blog, but sometimes standing is not the best option at all. The African savanna offers awesome grand vistas, but up close it is mostly thorny scrub-brush. Not all that photogenic really. I have found one of the best approaches for compelling animal portraits is to eliminate as much of the landscape as possible. One good way to do that is to lie down on the ground. The evening I made the image above I was driving on an a friend’s ranch, just east of Nairobi, Kenya. The sun was about to set and I was desperately searching for an interesting subject to place in the foreground. Being situated right at the equator, the sun does not linger near the horizon very long, so you have to work quickly. 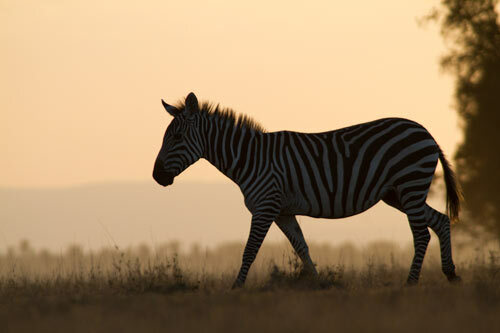 As I crested a slight hill, I spotted a herd of zebra crossing the road 50 meters ahead of me. 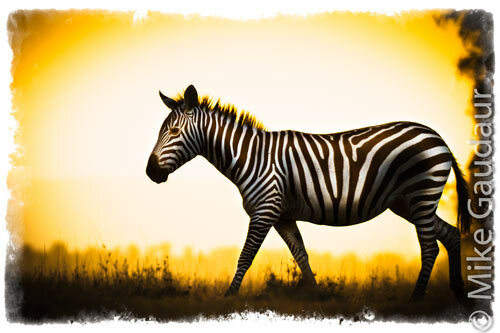 I knew I wanted to isolate a lone zebra against the setting sun. To get that angle with clean background I planted my beanbag in the dirt and stretched out behind it. The perspective was very cat-like, even if my return to vertical orientation was somewhat lacking in cat-like agility. I thought it would be helpful if I include JPEGs to show what the RAW captures actually looked like before Lightroom and Viveza worked their magic. The image was shot with a Tamron 200-500mm lens at 500mm on a Canon EOS 7D. The exposure was 1/320 at f-9. An Adobe Certified Expert in Photoshop who loves to see what can be drawn out of a RAW file. This entry was posted in composition, image editing, photography, technique and tagged lightroom. Bookmark the permalink. What makes a photographic image a work of fine art? This blog examines this question in in both principle and process. Save money by ordering direct from the artist for shipping within Canada. Contact Mike and request a quote.